While Remote Desktop and Remote Assistance features in Windows operating system are useful, they can leave your computer vulnerable to remote exploits. You can find below some effective methods to protect Windows computer from remote attacks. A remote attack can be defined as a malicious act, designed to target vulnerable points in a computer or a network connecting multiple computers. In general, remote attacks are carried out to steal data, take control of the PC, cause damage or infect the computer with malware, adware and viruses. 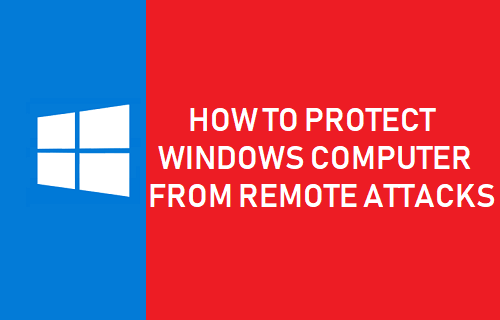 So, let us go ahead and take a look at some of the precautions and steps that you can take to protect Windows computer from remote attacks. An easy way to detect the presence of harmful programs on your Windows computer is to periodically scan your PC for malware using Windows Defender or any other third party antivirus program installed on your computer. If you have reason to suspect that your computer might be infected with malware, you can first try to remove the malware using Windows Defender Offline. After using Windows Defender Offline, connect the computer to internet and go for a complete scan of the computer using Norton Antivirus or any other Third Party Antivirus Program installed on your computer. 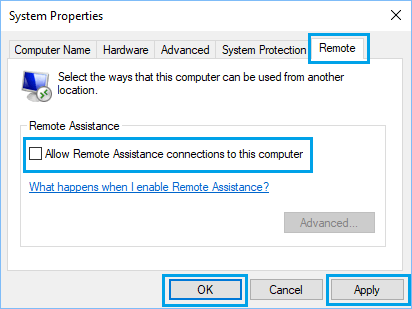 The Remote Assistance feature on a Windows computer is designed to provide Microsoft, Computer manufacturer or any other remote tech support person with remote access to your computer, in order to diagnose and fix problems. While it is not being used, you can keep this feature disabled, in order to prevent the possibility of someone gaining unauthorized access to your computer. Open Control panel > click on System and Security. On the System and Security screen, click on Allow Remote Access option located under “System” section. On the next screen, uncheck Allow Remote Assistance connections to this computer option. Click on Apply and OK to save these new changes on your computer. 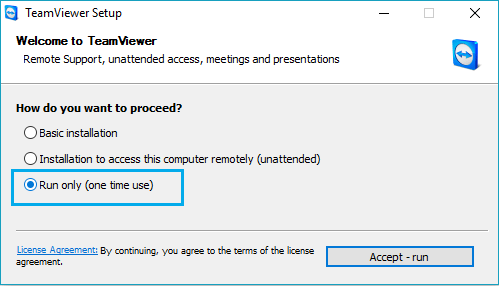 While Remote Desktop Client Connection Program is available in all versions of Windows, the RDP server required to access a Windows PC remotely is only available on PC’s running Professional and Enterprise Editions of Windows 10. In case you are using the Professional Edition of Windows 10, make sure that you disable Remote Desktop on your computer while it is not being used. On the next screen, select Don’t Allow Remote Assistance connections to this computer option. Click on Apply and OK to save this setting on your computer. 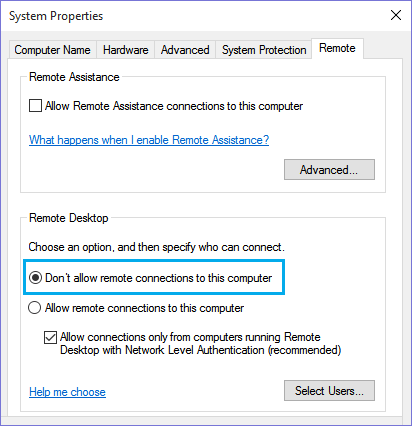 Remote Desktop and Remote Assistance are not the only applications that can allow remote connections to your computer. There are other Programs like TeamViewer, Chrome Remote Desktop, LogMein, VNC Connect and AnyDesk that can enable remote desktop connections to your computer. Consider uninstalling or disabling these programs on your computer, in case you are not actively accessing your home computer from your place of work. Many of these Remote Desktop Programs provide the option to just run the program once, instead of installing the program on your computer. In case the Remote Control App does not have the Onetime Run feature, you can Uninstall the App after using it or block Remote connections on your computer. Popular browsers like Google Chrome and Safari provide the option to store passwords and automatically fill passwords. While this makes it convenient to use passwords, there is always the possibility of browser on your computer being attacked and your passwords being stolen. The option to save Passwords is enabled by default in Chrome browser, but you can easily disable this option in Chrome Advanced Settings screen. Click on the 3-dots Chrome Menu icon located at the top-right corner of your screen and click on Settings in the drop-down menu. Next, scroll down and click on Advanced. Next, Scroll down to “Passwords and Forms” section and click on Manage Passwords option. On the next screen, disable Offer to Save Passwords option by moving the toggle to OFF position. While using dedicated Password Managers like LastPass, Zoho and others is way safer than storing passwords in browsers, you need to be aware that even popular password managers have been attacked and breached by hackers. Also, the Master Password feature as available in certain web browsers is not considered safe by security experts. In case you have Confidential, Personal or business related information on your computer, make sure that you make it difficult for anyone to access such information. If sensitive information is easily available, anyone who is able to gain access to your computer will be able to view, copy and distribute such information. Hence, make sure that confidential files are always kept in encrypted and password protected folders on your computer. 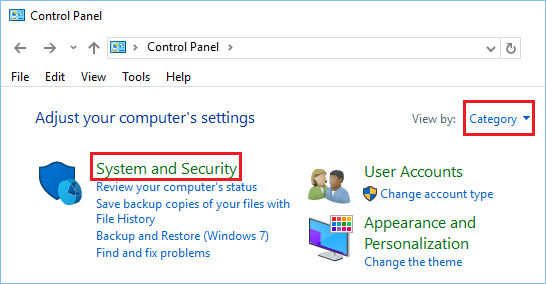 In case you are using the Professional edition of Windows 10, you can simply right-click on the Folder > Click on Properties > Advanced and check Encrypt Contents to Secure Data option. Windows 10 Home Edition users can make use of various third party tools that are available in the market. In this regard, you may want to take a look at this article: How to Password Protect Folders in Windows 10. Google’s Chrome browser can help you detect harmful and unwanted programs installed on your computer. Open Chrome Browser, click on the 3-dots menu > Settings. On the next screen, scroll down to the bottom and click on Advanced. Scroll down further to “Reset and Clean Up” section and click on Clean up computer. Next, click on Find and Chrome will start searching for harmful software installed on your computer. If Chrome finds suspicious or unwanted programs click on Remove to remove the program. You can also manually check and uninstall programs and extensions that you do not recognize or remember installing.